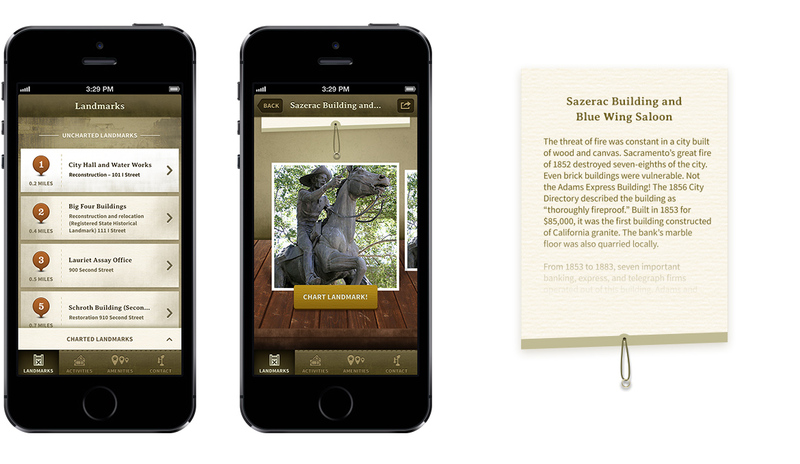 The Sacramento History Museum needed a mobile app to promote Old Sacramento. Old-timey meet Modern. Modern, this is Old-Timey. Now let’s all be friends! Old Sacramento is an icon in the Sacramento tourism market, so their app’s excellence had to exist in the combination of historic elements like imagery, presented over new technology, like Google Maps. Balance and a reverence for archived sites as well as new tourism guided our discovery and aesthetic strategy. Uncovering more fun than you had imagined. The Old Sacramento app includes an activity pack that can be purchased for only $1.99 and includes trivia, guided tours, and an activity pack that earns users coupons at local establishments. Local businesses were thrilled to benefit from cross-channel marketing that funneled additional business, like a good ol’ pat on the back from one local to another. Pioneering users to discover the unknown. Most locals don’t realize how much there is to Old Sacramento, so the Landmarks section of the app provides users with expanded information about dozens of local landmarks. Each one full of rich history that helped define the Sacramento region. In addition, expanded information and amenities list historical facts and important locations within one cohesive brand experience. The Old Sacramento app was a fun project because the design required something different. Mobile apps are so focused on being new and modern that it was refreshing to dig into a project that needed to look old. Not old in a bad way, but in a way that celebrated an era that is so beloved by Northern California. Our designers were able to dig through historic photography from their archives to merge this old-timey brand with new technology. 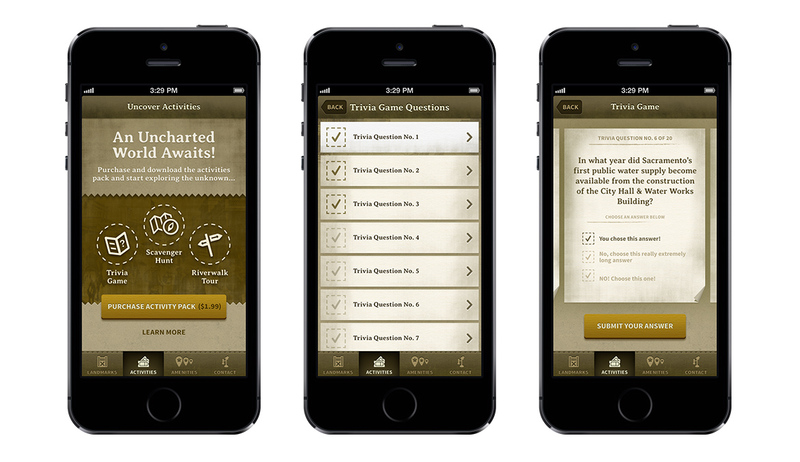 The resulting app not only feels like it belongs in the 1800's, but also in the 21st century. Discovery and engaging elements in the app help keep users coming back and exploring Old Sacramento.